Pastor Jeremy and his wife, Brooke, have been married since September 24, 1999 and are blessed with three incredible sons. God brought them together with a common goal, get the “Good News” of Jesus Christ out to as many people as possible. Jeremy served in full time ministry at Calvary Chapel Tri City in Tempe, Arizona from March of 1995 – July of 2009. Jeremy began as the Pastor of the High School Youth Ministry and served in that capacity for 7 years. Eventually he was asked to take on the roll of Associate Pastor and spent the next 8 years serving the flock as the Lord led and allowed. As the Associate Pastor, Jeremy headed up the Men’s Ministry as well as being responsible for marital and pre marital counseling for the church body. Jeremy was also the church administrator for 12 of the 15 years he was at Calvary Chapel Tri City overseeing the day to day business of the Church. Brooke is a gifted Women’s Ministry teacher and is being used to lead the Women’s Bible studies at CCC-CR. She’s been used by The Lord in a variety of ways over the years. Brooke has long supported and taught in purity ministries and has written and published “A Ladies Guide To Purity” in both a Teachers Edition and Student Edition. She has taught groups, small and large, as well as young and old, about the wonderful gift God has for those who wait upon Him. Brooke’s Ministry also shines a light of hope for those who have made mistakes as we know our Lord’s mercies are new every morning! Before joining the staff of Calvary Chapel Tri City Jeremy studied Business. After completing the course schedule he joined the staff at Calvary Chapel Tri City and enrolled in the School of Ministry offered there, completing the requirements in 2007. Jeremy went on to obtain a Bachelor’s of Biblical Theology degree from the Maranatha International Bible College which was an extension campus of the CCBC in Murrietta, California. Also, since 1998 Jeremy has been assisting Churches from all over the Country to arrange Biblical tours of Israel. He has personally traveled to Israel over a dozen times in both Mission and Tour capacities. He has also been involved in various other Mission field operations in Mexico, Europe and Honduras as well. 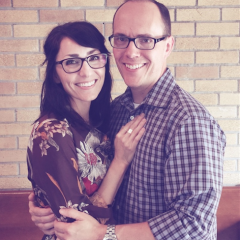 In 2006 Jeremy, and his wife Brooke, felt called of The Lord to go out and plant a new Church. They immediately began praying for The Lord to lead them to the fields that needed tilling. On January 02, 2009 Jeremy and Brooke traveled to Cedar Rapids for the very first time where God made it clear they were called to plant a new work for Him. By July of 2009 they had moved to Cedar Rapids and began holding worship services on August 02, 2009 and the body has been growing ever since. We invite you to come by and be a part of the work the Lord is doing here.